Did you ever feel like the story wasn’t about you? That perhaps you were dealing with a struggle that didn’t really feel like it “belonged” to you? We can always learn and grow. But perhaps sometimes (maybe all the time) we need to remember that we are part of an interdependent species. Sometimes we are here to be an antagonist, instead of a protagonist. Or sometimes we might choose to deal with a struggle to help the greater good. “Messages for the Masters,” Brian Weiss, M.D. Or perhaps we have volunteered for a struggle to help another. Sometimes you just need to take a step back and contemplate that it might not be all about you. But since we are interdependent and part of all, everything ultimately is. No matter what the struggle and why you are facing it though, you need to remember that you always have a choice. You can choose your actions to be actions in love and inclusion or you can choose your actions for ego. This does not mean that you should allow yourself to become a victim! When you are facing a struggle, you still need to take responsibility for it.  You still need to Unscribble it to create the life you want. Don’t let yourself be taken advantage of. Use your integrity, communication skills, and problem solving abilities to work through any struggles you are facing. No matter who the protagonist in the story is, assume it is you (even if it might not be) and that you are in the struggle to learn and choose your conduct wisely. Choosing to be the protagonist allows you to take back control of your own destiny. Remember, we are interconnected, so the wiser you act, the better for the whole and the better for the true protagonist. Also, finally, just because someone needs to learn a lesson (or you think they do, or think you might be playing a part in someone else’s big lesson), it does not mean that YOU are the one who has to teach it to them. Do what you need to do to resolve the situation to your satisfaction, but don’t be the one who tries to teach someone. Lessons come, but learning is optional. If they want to learn, they will. If not, they won’t. YOU learn. YOU clarify how you want your life to be and how you are going to go about getting your dream life. Let others deal with their own lives. We may not be on this earth to learn lessons. Or maybe we are. Who knows? But we are here. We might as well take the opportunity to experience and to grow. Growth often comes from struggles, so welcome the struggles. They are making you into something that is better than you were before, IF you allow them to. Learn from the frustration by finding solutions and exploring paths to get to them. Focus on the solution and the path instead of the problem. The other party will learn if they want to. Takeaway: Sometimes you are playing a role in someone else’s drama. Even so, you still need to act like you are the main character and Unscribble yourself to the life you desire.